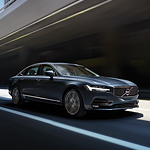 The Volvo S90 is a luxury sedan with a lot to offer. At Kempthorn Motors in Canton, you can see all of the interior features for yourself. You’ll see how the high-quality materials keep getting better as you choose higher trim levels. A lot comes standard within the S90. This includes everything from lumbar support to dark flame birch wood inlays. You’ll also love the premium sound system and the folding seats, providing you with more cargo space. As you go up to the higher trim levels, you can also explore premium leather seating, a four-zone electronic climate system, and a charcoal headliner. The sedan fits five people comfortably. There’s a lot of spacious leg room for passengers, even in the backseat. You can also opt for heated seats for everyone and a backrest massage for the front seats. Voice-activated controls will also make it easier for you to take over navigation and audio controls.